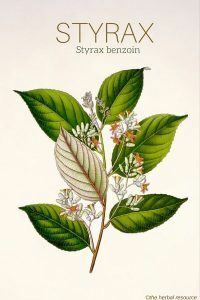 Other Common Names: Gum benzoin, gum benjamin, Benjamin tree, benzointree, Sumatra benzoin, styrax, benzoin (Swedish), benzoebaum (German), bálsamo de Benjuí (Spanish), arbre à benjoin (French), an xi xiang (Chinese). Habitat: The plant grows wild in the tropical rain forests of Indonesia. Different styrax species grow in Java, Thailand, Cambodia, Vietnam, and China. Description: Styrax benzoin is an evergreen tree that can grow up to 10 meters tall. The bark is gray or brown and the leaves are pointed, oval, around 14 cm long and 5 cm wide with fine gray hairs on the lower surface. The flowers form small clusters and are white, bell-shaped and fragrant. Plant Parts Used: It is the resin that is used in herbal medicine. The resin is obtained from incisions that are made on 8 to 10-year-old trees. The resin has a cinnamon/camphor-like aroma. 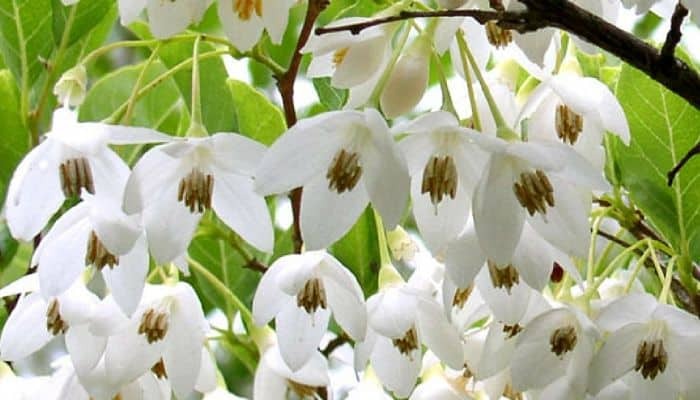 The resin of the styrax benzoin tree contains cinnamon acid ester, benzoic acid ester, free acids (such as benzoic acid), styrol, styracin, phenyl-prophyl cinnamate, benzaldehyde, vanillin, and an oily fragrant liquid. The styrax resin is a widely used ingredient in incense, and it was believed it could help to drive out evil spirits. The resin is also used as a fixative (a preservative) and a fragrance component in perfumes, cosmetics, soaps, and toiletries. 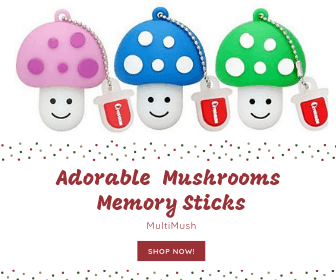 It is otherwise used as a flavor ingredient in food, soft drinks, and alcoholic beverages. Benzoin resin is a powerful antioxidant that can prevent fat from becoming rancid. The use of the resin in herbal medicine is usually in the form of a tincture. It is made by dissolving the resin in alcohol. The tincture tends to have a viscous, sticky and oily consistency. The styrax benzoin tincture is used internally as expectorant and disinfectant and can be a good herbal remedy for respiratory ailments and throat infections such as colds, flu, cough, asthma, chronic bronchitis and sore throat. The resin is used as an ingredient in several types of cough and cold medications. A mouthwash made from the tincture can be used to treat cold sores, thrush (oral candida infection), and other wounds or inflammation of the mucous membranes. Dentists also use tinctures of benzoin resin as an anti-inflammatory agent after tooth extraction. Used internally, the resin also works as a disinfecting agent for the urinary tract. The resin is a popular ingredient in skin care products and used to treat wounds, boils, dry skin, inflamed or irritated skin and eczema. The resin seems to cause constriction of the blood vessels and stimulate the formation of new cells. In addition, the resin has antiseptic and anti-inflammatory properties. The resin also has a reputation for working well as an herbal remedy for poor circulation, muscle pain, rheumatism, arthritis and gout. The herb comes in various forms and is used in numerous products. For best results, the manufacturer’s instructions should be followed or a trained herbalist should be consulted for the correct dose for the ailment in question. Styrax benzoin resin should be used sparingly. A certain risk of hypersensitivity to the resin may occur. The scent of the benzoin resin can be soporific in high concentrations. To date, there have been no reports of known interactions with other medications, but further studies are needed. As with all herbs intended as an herbal medicine a professional health care provider should be consulted prior to use. Lawless, Julia: The Illustrated Encyclopedia of Essential Oils. Shaftesbury, England. Element Books 1995. Bown, Deni: Herbal. The Essential Guide to Herbs for Living. London. Pavilion Books Limited 2003.